Published on September 15, 2014 in Holidays in Germany. Closed Tags: holiday accommodation, Mosel, Moselle Valley, self-catering cottages, Vineyards, Wine Festival. 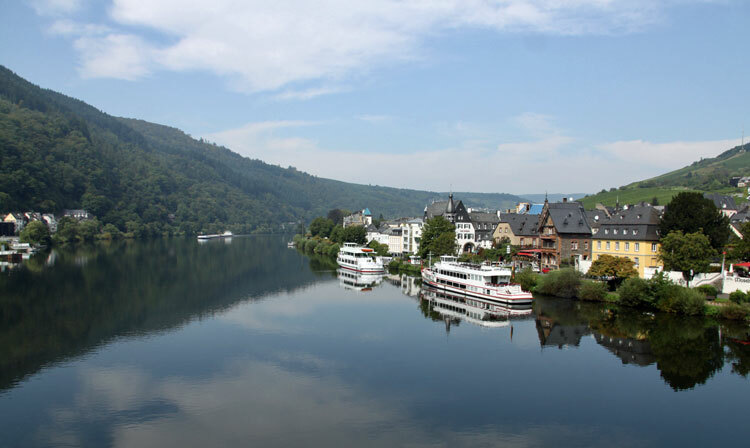 The River Moselle undulates in twists and turns southwards from Koblenz to Trier. 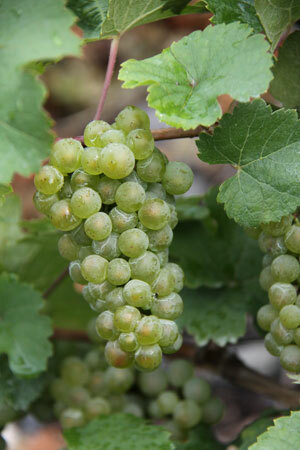 Vast swathes of neatly ordered vineyards grown in rows on the hills that rise from the river banks. Alongside both sides of the river banks are wide cycle and footpaths that carry thousands of tourists from one wine producing village to another. Some of the town names such as Piesport are familiar because of the wines produced there, others may be less familiar and the joy lies in their discovery. Wine tasting is a pleasant activity on holiday that requires little apart from the judgement and appreciation of Moselle wines. It can be enjoyed by amateurs and professionals alike. All that is required is a desire to try the wine. For some, the colour,the bouquet, taste and after taste all matter, for others it’s simply whether it taste’s nice enough. There is the risk that prolonged wine tasting makes even the poorest wine taste magnificent after a time but that does not matter to most. 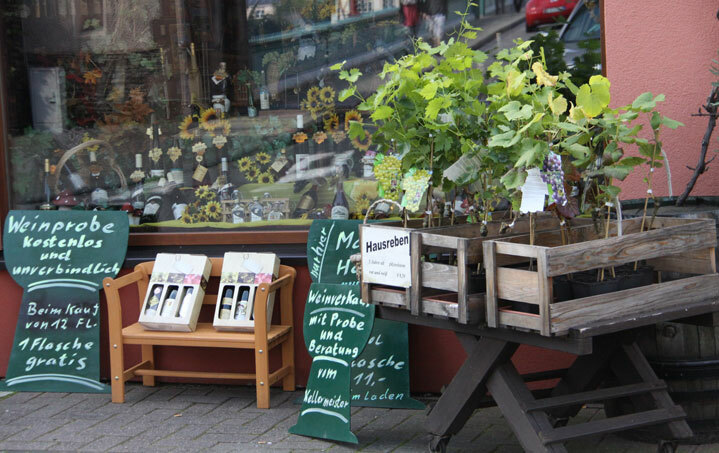 A string of vine growing villages lies between Koblenz and Trier, each home to a a wine producer or more. Holiday accommodation is sometimes provided by the grower although there are plenty of hotels and camp sites along the length of the river. Floods marked the history of this region and many hotels shown the height of floods in various years on the sides of their buildings. The hoteliers would receive a few hours warning, long enough to carry their most treasured possessions and furniture to higher floors. The buildings would then take up to a year to dry out after a flood. Fortunately, modern defence barriers have reduced the threat of constant flooding. Christmas and early in the New Year were the most common times for flooding. 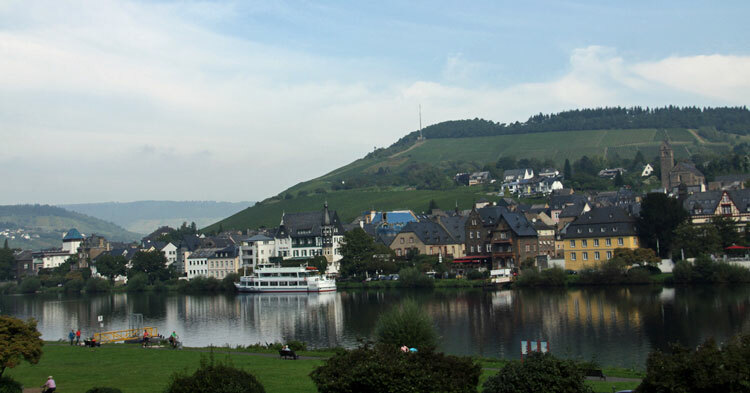 The autumn wine festivals along the Moselle attract tourists in their thousands. 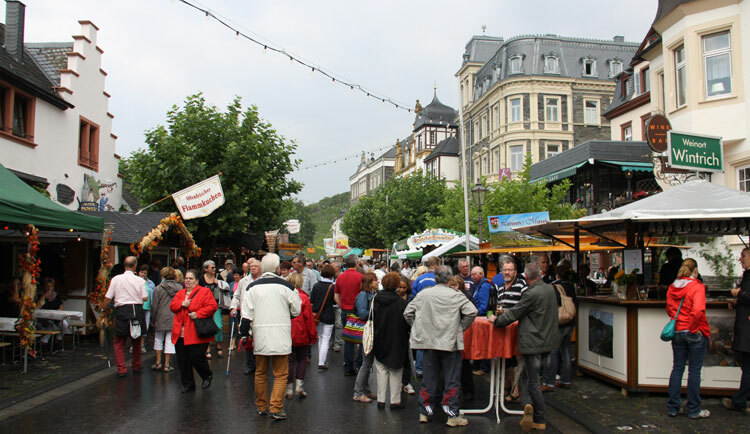 The wine festivals held in the larger towns such as Bernkastel are conducted with much enthusiasm, colour and noise. 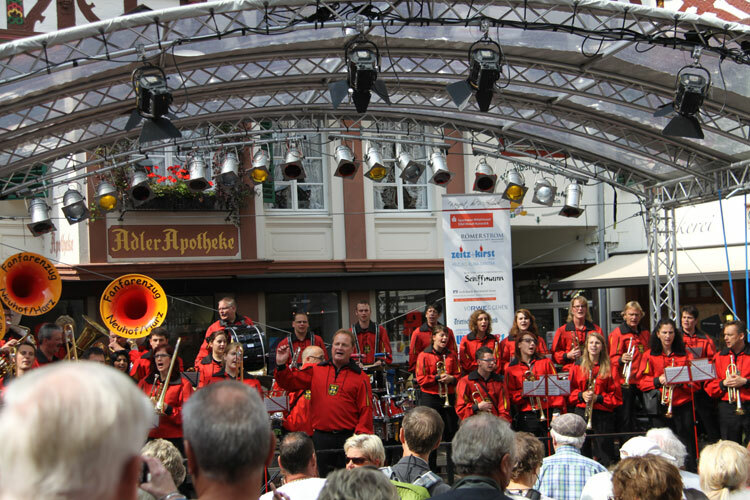 Gaily attired Oompah bands play up-beat music with gusto to cheer the crowds and create a party atmosphere. The wine sellers set up stalls where they sell wine by the glass to the passing throng. A wine glass is hired on arrival, filled and refilled, then returned and a deposit reclaimed at the end of the evening. Although the main proceedings are not in full swing until the early afternoon, it is advisable to arrive early if driving simply to obtain a parking space. Otherwise, catch the bus, train or any other form of group transport. Food stalls of all kinds sell hot and cold food, there are stalls with half a metre long wursts, hamburgers, pizza, waffles and just about everything else. The local restaurants do a roaring trade, people sit out at pavement cafes and watch the fun. Groups of friends arrive dressed up for the occasion and everyone thoroughly enjoys this time of great festivity. 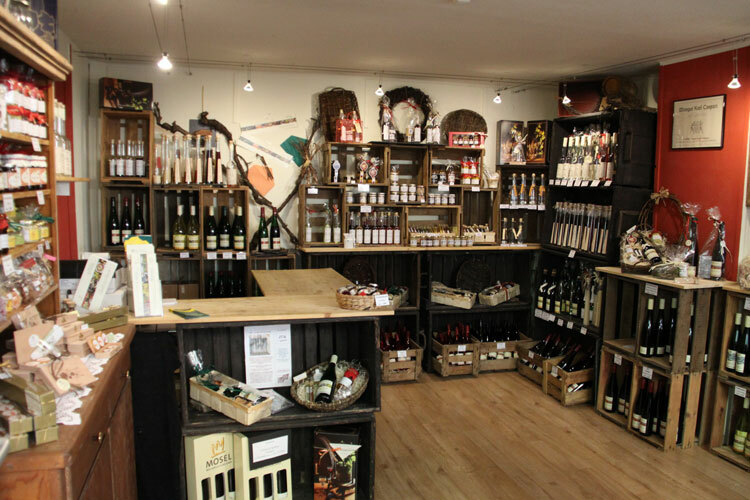 isitors are welcome to purchase wines by the bottle or case to take home. The various wine shops also sell a selection of vines to grow in gardens back home. The evening usually ends with a firework display over the river. The amazing views are lit up in bright colours and reflected in the water. The Mosel Loreley Fest held on the first Saturday of July is an extravaganza of fireworks. All ages attend the wine festival from babes in arms to aged pensioners out for a good time. People bring their dogs, their entire families and people watching can be most entertaining. The demand for holiday accommodation during the wine festivals is huge, hotel rates are high. The less expensive alternatives are self-catering holiday lettings, pensions and camping. The Moselle Valley is worth visiting for the scenery and especially for people who like to cycle along the traffic free and flat cycle lanes. People visit from all parts of Europe and even some from the southern hemisphere to find out what all the fuss is about. See iof there is somewhere that you would like to stay for a holiday in Germany.